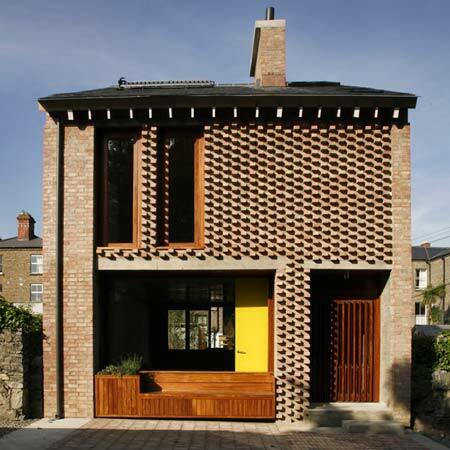 Dublin architects TAKA have added a mews house with protruding brickwork to an existing Victorian home in Dublin, Ireland. The façade uses two different patterns chosen by the brick-layer, inspired by the brickwork of the Victorian house. In the first pattern, alternate bricks are laid across the usual direction, creating protrusions from the wall. The other forms an open mesh that acts as ventilation for the spaces behind. The two separate buildings will house two different generations of the same family and are connected at the rear by a shared garden. These two new homes house two generations of the same family (A renovated Victorian House for the parents sharing a rear garden with a new Mews house for one of the daughters). The now grown-up family had recently moved out of their long-term family home and wanted these new homes to maintain some sense of continuity with their former lives. Two intertwined themes run through both homes, those of memory and tectonic expression. The memories of the family are used as a conscious architectural driver throughout both houses. Their social rituals are given tangible form within the design of the new houses. Typical domestic objects are distorted in material and scale to form a psychological landscape specific to the occupants. The daughters recollection of the stairs in the old house being ‘another room’, finds built form in an enlarged landscape stairway offering spaces for pause. Her fond memories of the kitchen as a social space and sitting by the open fire distort the two new ‘hearths’ (one for cooking one for fire) into non-orthogonal shapes suggesting uses yet open to appropriation. Finally the insistence of the ‘fire being the centre of the home’ is realised by the location of an industrial scaled chimney rising through the scheme at the centre of the plan, organising the spaces throughout. In the parent’s new home their anxiety about moving from the old house was addressed. Their weekly social ritual of the wider family gathering together for Sunday dinner was a focal point, in order to maintain the continuity of the family unit. In the new home the dining table is given priority of place and a ritual character. Cast in concrete in an altar-like form the dining table communicates its importance through its immovable materiality. As a further signifier of the special value of this space the expression of construction takes on a cultural role. In the wall behind the table custom-made glazed bricks are set. Named ‘Ruskin’ bricks (after Ruskin’s inspirational theories on construction in architecture); the bricklayer was given 100 identical bricks to lay in any combination he saw fit. Intended as both a marker of the process of construction and an explicit elevation of brickwork to the position of art, the result is a random graphic pattern that is not simply hung on the wall but part of the very construction that forms the building. A similar interest in constructional expression is seen in the Mews house. The Mews house’s façades take their key from the Flemish-bond brickwork walls of the Victorian House, seeking a kind of ‘constructional context’ with its older brother. The unique bonds are the result of ‘separating’ the Flemish bond into two layers, and conceptually situating the home in the space between these two layers. The extrovert front façade receives the ‘projecting brick’ layer, which oscillates in appearance depending on natural light conditions. To the rear, the façade becomes a mesh of brickwork where those projecting bricks on the front leave their resultant holes in the rear wall, allowing ventilation to the rooms behind to be taken directly through this brick skin. Throughout both homes, construction is expressed directly as the finished product imbuing these two new homes with a powerful, domestic character. TAKA was founded by Alice Casey and Cian Deegan in Bangladesh in 2006. Alice Casey and Cian Deegan were born in Dublin in 1978 and 1980 respectively. They graduated from Dublin Institute of Technology in 2003, and moved to London in 2004. In London, Alice worked with Curtis Wood Architects and Cian worked with Niall McLaughlin Architects. University College London. Following their time in London they travelled extensively throughout Asia, Australia, South and North America, studying examples of vernacular architecture and culture. Moving back to Dublin in 2007, Alice has worked with dePaor architects, Cian with O’Donnell + Tuomey Architects. In 2008 TAKA became the youngest ever representatives of Ireland at the Venice Architectural Biennale as part of The Lives of Spaces exhibition, and have recently completed their first projects House 1 + House 2 in Dublin. Both Alice and Cian have been Upper School studio tutors at the UCD School of Architecture. TAKA have been featured in Architecture Ireland, The Dubliner, The Sunday Times Culture Section and Elle Deco Japan. TAKA is a practice concerned with the communicative potential of architecture, with tectonic expression and with meaning. TAKA is based in Dublin, Ireland.